Nom nom nom. 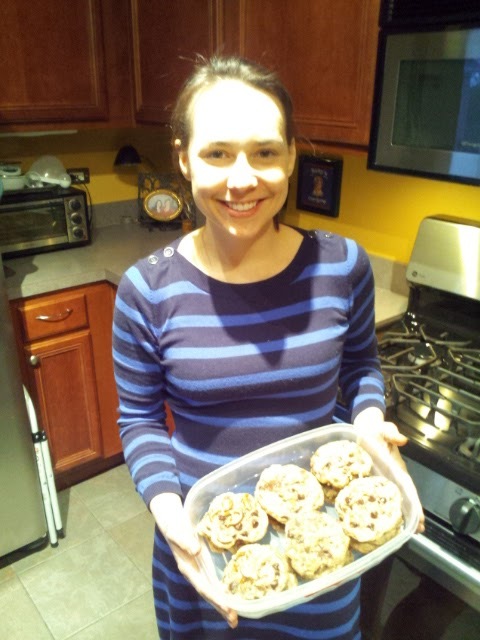 I make my mom a little treat for most holidays, and Mother's Day 2013 is no different. I couldn't figure out what to make her, but I know she loves cookies. I have yet to meet an individual who doesn't love cookies. If they say they don't, they're lying. So I came up with something new and novel for my mom this year. 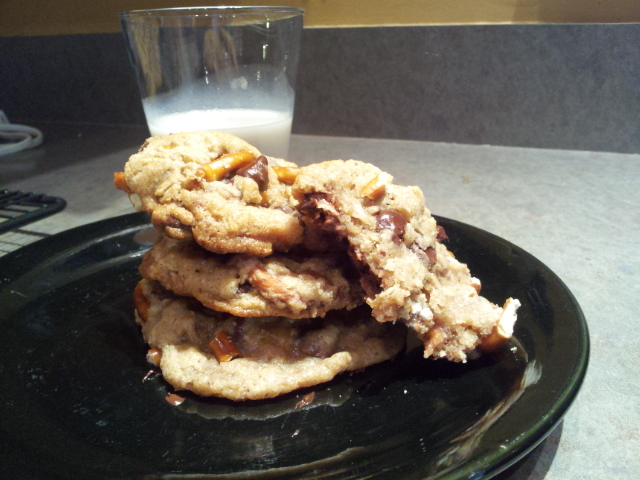 I remembered a recipe for cowboy cookies, but decided to add my own twist. 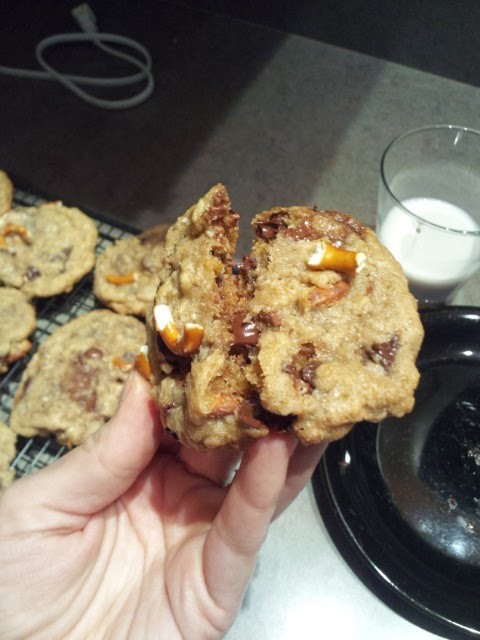 I've been meaning to use rice krispie cereal in cookies since my mom and I made chocolates with them at our chocolate-making class. 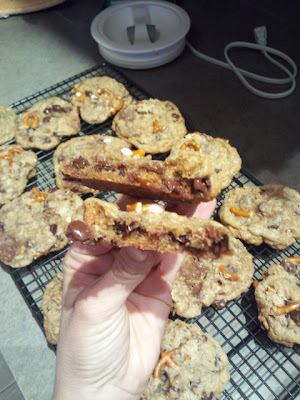 Plus, I hypothesized that the crunch and salt of pretzels would set off the sweetness of the semi-sweet chips. I also had a bag of milk chocolate Lindt eggs from Easter that made an appearance, too. The key to making these cookies a real success is freezing the dough before baking. 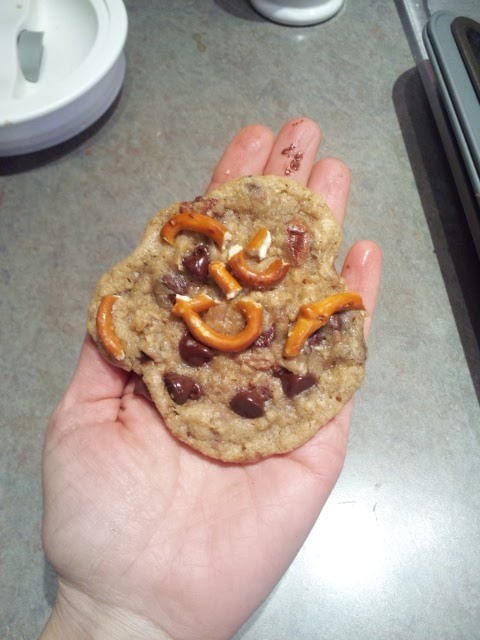 This prevents the cookies from spreading too much in the oven, and allows the ingredients time to meld together. Another key to this cookie is to not overbake them - remove the cookies from the oven when they still look a little underdone. 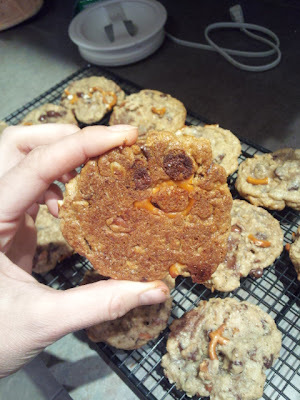 I'd personally rather have underbaked cookies than overbaked cookies, so I baked these exactly 15 minutes, then allowed them to cool on the pans for another three minutes. 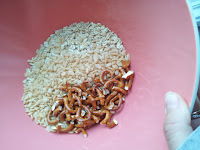 An optional finishing touch is adding a sprinkle of kosher salt, but the pretzels alone might be enough for your palate. What I ended up with was a salty and sweet cookie packed with oats, crispy bits and a creamy interior. I think my mom will love these cookies, and if she doesn't, I already do. 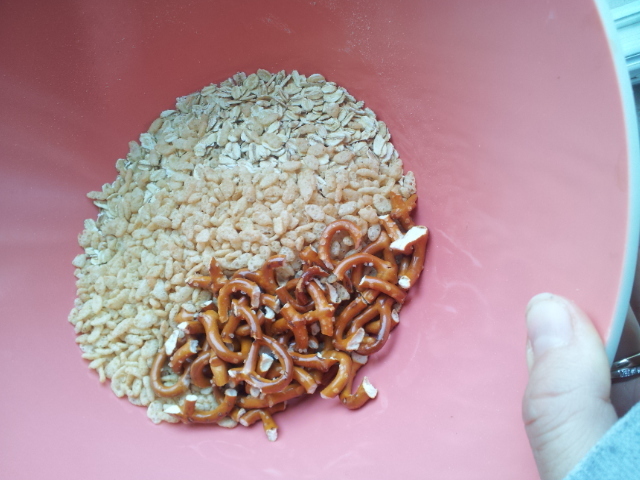 Mix together the oats, cereal, 1/2 the pretzels, flours, soda, powder and cinnamon. Set aside. Using a stand mixer with the paddle attachment, cream together the butter and sugars until they're light and creamy. Add the vanilla and eggs and whip together until incorporated, then gradually add the dry ingredients. Finally, add the chocolate and mix. 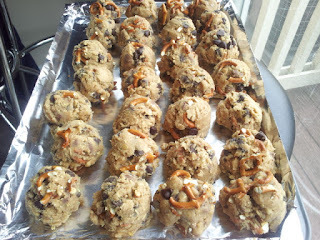 Using a large scoop (3 Tablespoons), portion out the cookies and roll in remaining pretzel bits. Place the portioned out cookies onto a tray and freeze for two to three hours. 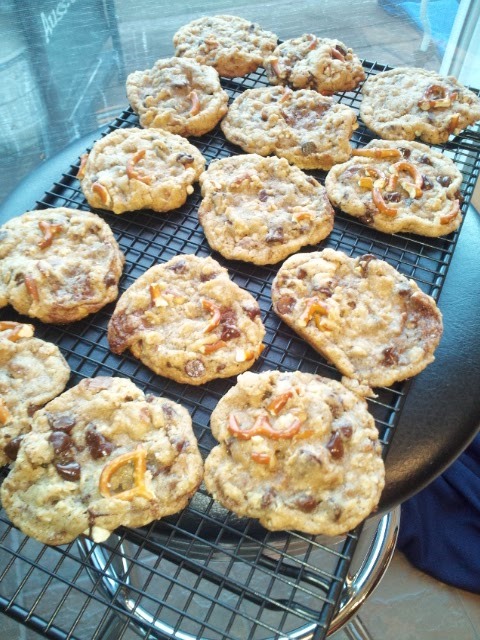 Preheat your oven to 350 degrees and place no more than eight cookies per baking sheet - these guys spread out in the oven. Bake for 13 to 16 minutes, depending on your oven, rotating the trays halfway through the baking process. Remove from the oven and dust with kosher salt, if desired, and allow to cool on the trays for three to five minutes so these guys set up. Place on cooling racks for the remaining time until they're completely cool, then store in an airtight container. These look amazing! I don't have a mixer like that, do you think I could make these with my hand held one? A hand mixer would work just the same!